Summer is certainly upon us as we near the end of June with mild overnight temperatures and warm days bringing strong growth over the last four weeks. Since our last news I have been looking at climate figures for May 2018 which indicated that May had the highest potential for plant growth of any May in the last decade. 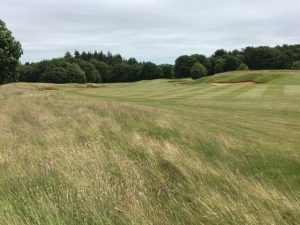 These conditions did continue into June but as we near the end of the month it is obvious out on the course that growth has slowed and things are settling down. The result of these spring conditions were, despite very low fertiliser inputs, extremely lively grass growth leading to masses of clipping production. There were times when the team were struggling to create a tidy finish and the only course of action was to increase the frequency that we were mowing and to make use of our heavy duty blower to disperse clippings. Low levels of rainfall are creating firm playing conditions which rightly so reflect the current conditions. We are irrigating greens, approaches and tees to maintain plant health as the priority with appearance as a secondary consideration. Fairway irrigation is being applied sparingly with good ball run and seasonal conditions being the focus here. Long rough areas have grown in quite heavily but as the ground dries and the season progresses these areas will thin out. 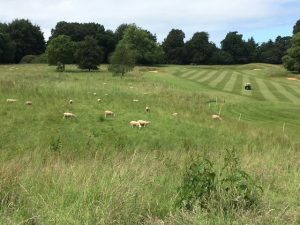 Seasonal grazing has commenced on the twelfth hole, adjacent to the driveway and we will graze this area down hard before undertaking weed treatment. Our next area for grazing will be the area between sixteen, seventeen and Queenwood Lodge. Marginal areas close to fairway landing areas will be assessed and if necessary be mown once before allowing thinner regrowth. The current greens mowing height is 4mm with mowing six days per week and rolling three days per week in addition to mowing. Approach and tees height is remaining at 9mm. Topdressing of greens is being undertaken every three to four weeks although this will not be obvious due to brushing and irrigating immediately following sand application to aid integration. The first week of August will see our summer greens renovation programme undertaken and like 2017 we will be sticking to a heavy sand topdressing application combined with solid tining and finishing off with bentgrass overseeding. This technique allows us to integrate significant amounts of sand and open the surface up for maximum aeration for seedling establishment but turns the surface around quickly with fast recovery and reversion to normal playing conditions in double time.